We offer heavy duty cam grinding machine that has the capability to grind any oval shape grinding using master cam. This machine is specially designed for pharmaceutical die and punch. TOSS MAKE INTERNAL GRINDER WITH FACING ATT. sm-3 with manually operated table traverse in place of hydraulically operated table traverse. Our organization is the dominating name operating in retail and commissioning section of the industry. We provide our clients with used grinding machines that are sourced from reliable names. 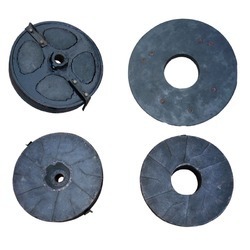 Our range is extensively used in abrasive wheels as the cutting tool. Via shear deformation, a small chip from the work piece is cut by each grain of abrasive on the wheel's surface. We offer premium quality Grinder Main Body Roter extensively used in all industry. Offered at affordable prices the products are safe, strong and available in different capacities, sizes & designs. For cool grinding of spices turmeric, fennel seeds and all other spices, herbs.